Delhi University students protest against rising lawlessness of right wing student group. On 20th October a demonstration was held at Arts Faculty in north campus of Delhi University. Attended by more than a hundred students from universities all across Delhi and outside, predominantly women, it was a protest against the members of the political outfit ABVP for their alleged harassment of the students on 23rd September night, when the group had organized a Night March. On the aforementioned night, a gang of ABVP men along with ex-DUSU president Satender Awana walked into a Pinjratod march which had concluded into night vigil at Vijay Nagar. On being challenged, they started misbehaving with the students present there. The video that was posted by Pinjratod covering their night march and ABVP miscreants reached 34000 views which infuriated them. Ever since, the everyday aggressions being faced by the movement has constantly escalated. Last week, ABVP members threatened a student of law faculty and forced him to upload a video on social media, degrading Pinjratod and its movements. The rampant hooliganism of this organisation’s people goes unabated and unaccounted for. 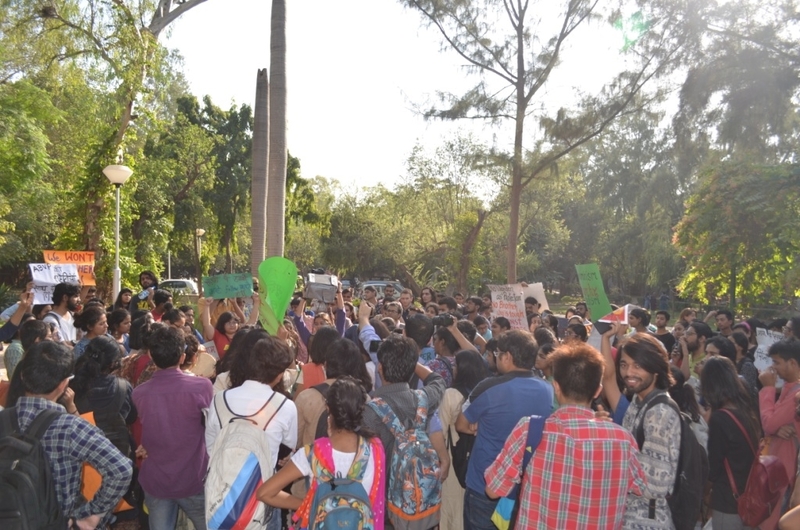 In response to their intensified hoodlum, Pinjratod organised a protest which called for a secure and democratic environment for students to live in. With the escalation of violence on campuses all across the country and particularly in Delhi, the attack on Ved Kumari, the dean of Law Faculty, also known to be a strong feminist voice on campus, the assault on a woman student in south campus, the assault and disappearance of a student in JNU and the showcasing of guns by the current DUSU president right in the student union office among innumerable every day incidents, small and big, reported and unreported, the campus no longer feels like a place that students, particularly women students can inhabit in a secure manner. 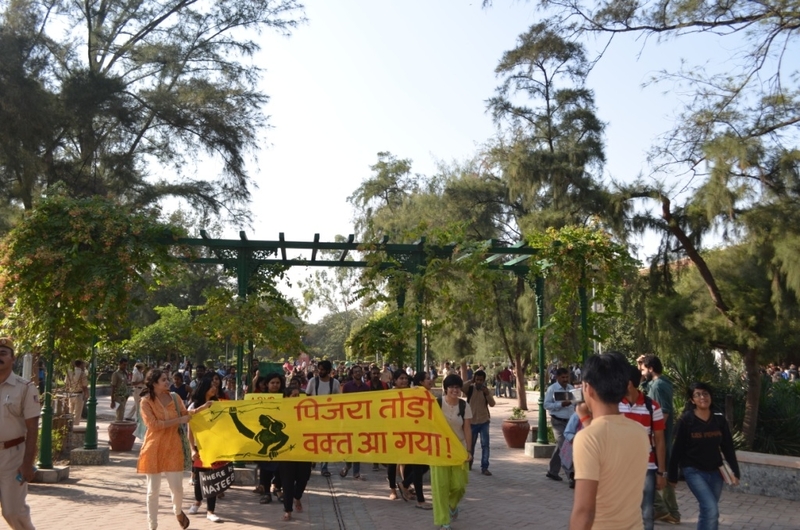 The demonstration comprised of slogans and vibrant songs being sung by the members on breaking the chains of patriarchy. The women spoke of freedom from the patriarchal norms and regulations at home as well as hostels and educational institutions. Slogans on the banners and placards reflected a sense of frustration from these long prevailing regressive and oppressive systems that have been at work. In midst of the event, a bystander posed some questions to the women from Pinjratod. His questions aimed at refuting the basis of the movement. However, those questions were listened and addressed to in a patient and prolonged manner. After some more sloganeering, it was decided that a small march would be taken out through faculty of law. This was initially resisted by the police force but after persistence the march started. 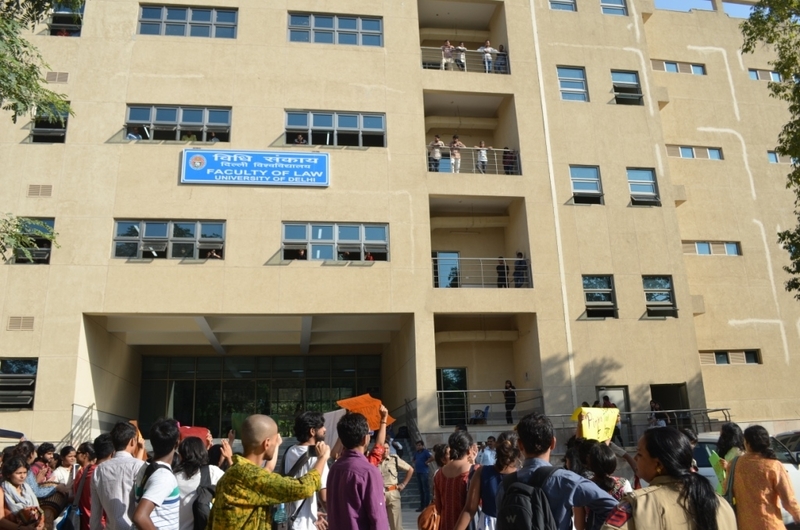 Sloganeering, the protestors marched through faculty of law and concluded at arts faculty. The demonstration came to an end with a sense of achievement and commitment to keep struggling till all chains of patriarchy and oppression are broken. 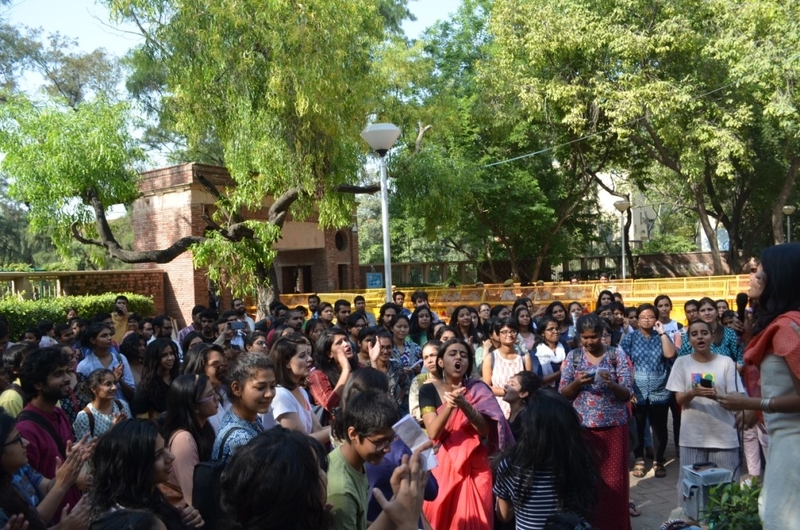 Many female students participated for the first time and their enthusiasm reflected the success of the movement as it ended with spirited songs and slogans. Pinjratod, since the beginning of its establishment has been raising issues which challenge the established societal norms and structures. 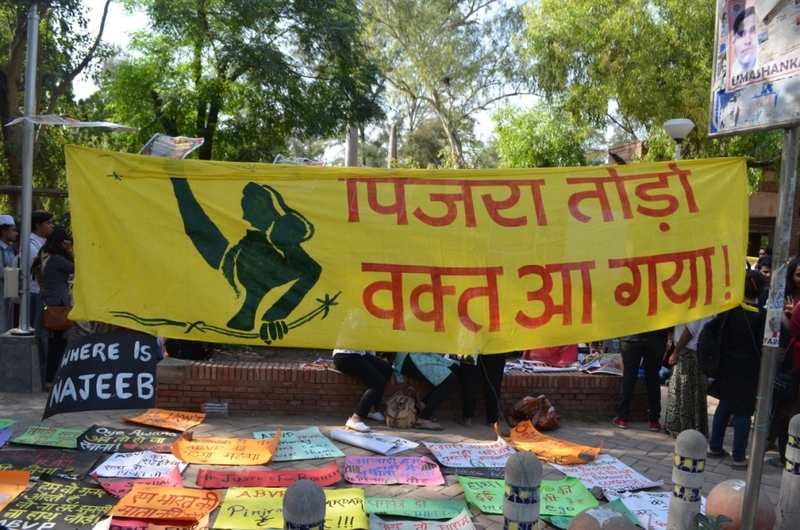 Demands such as changing the restrictive and regressive hostel regulations and moral policing by hostel authorities, access to safe and affordable hostel accommodation and pro-active functioning of Sexual Harassment Complaints Committee Cells, represents the aspirations of the modern generation and questions very notion of patriarchy. The political dispensations that thrive on pre-modern social structures and values are threatened by these aspirations. This women’s organisation has been voicing opinions and protests on all forms of oppression in various social and political institutions. It is therefore, that the Sangh and its affiliate organisations get enraged and go to the extent of physically assaulting the members. Since the nature of ABVP is patriarchal, the structural shift that Pinjratod attempts to bring challenges and makes them uncomfortable which then results in ABVP lashing out in such aggressive ways. The impact of Pinjratod and its movements have been so evident since the start, that ABVP had begun their retaliation in the first week of its establishment, by tearing down posters and verbally degrading their activists.